As students, we all receive emails from Student Activities, Lesley News and Events, and several other sources informing us about the various campus happenings in the upcoming week. However, there seems to be a strong disconnect between Lesley students and our school newspaper, the Lesley Public Post. I have spoken to students in my other classes, and found that many of them don’t even know that we have a school newspaper, while others may have heard about it in passing, but never gave it a chance. Why is there a barrier between students and our paper, and what changes can be made so that there is more awareness of the Lesley Public Post in our community? Some people prefer to have a print copy of a newspaper. If we had print copies in select locations on campus, such as the library or in the dining halls, the paper would be more visible and easier to encounter. High-population areas could be a great place for our newspaper to be seen by students and faculty alike. There are numerous bulletin boards around campus, and they have some great information on events around campus. These spaces could be a crucial component to advertising our newspaper. This is the perfect place to call for more writers or inform students about stories in our paper. These printouts could not only be put on bulletin boards, but on the dining hall tables as well. A website can only be eye-catching if someone chooses to visit it. However, if students don’t know that we have a paper, how can we expect them to visit our site? Instead, having interesting visuals can bring awareness to the Lesley Public Post, while still giving viewers the option of visiting our site. Although I’ve listed a few suggestions on how to improve the connection between students and the Lesley Public Post, I think the best way to approach this issue is by asking the community what they think. So, how do you think we can increase the reach of the school newspaper? Do you think these suggestions would be helpful? Why or why not? Additionally, leave us a comment with your own suggestions and ideas. Communication and collaboration are incredibly valuable, so your feedback is critical to the improvement of our paper. You can reach out to us on our Facebook page, or send a comment to our editor. We look forward to hearing your ideas: the Lesley Public Post has been publishing since 2010, and we want to make it even better in the Fall semester. 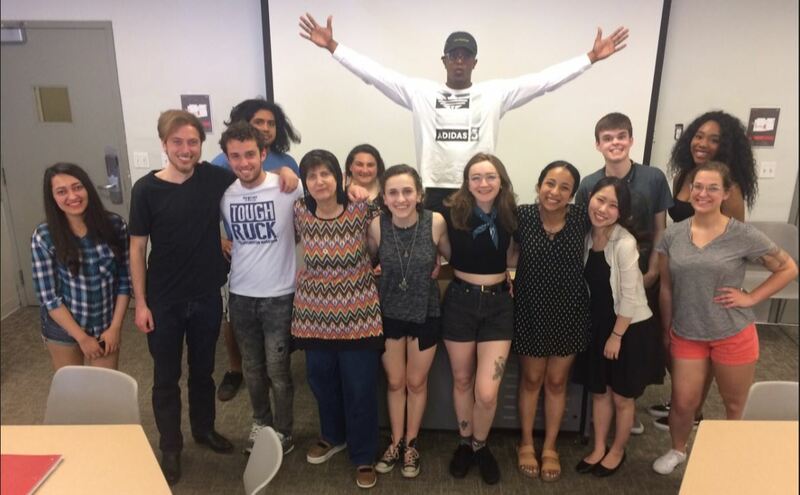 Photo of Professor Halper’s Public Speaking class, Spring 2018; several of the students have written for the Lesley Public Post, but others had no idea the newspaper even existed.